“Some people were shocked and horrified, other people were interested and fascinated… And some didn’t even blink an eye.” So reflects Mr Pearl, the legendary corset maker famed both for his creations and for his personal commitment to his own craft – wearing corsets day and night for decades, maintaining an impressive eighteen-inch waist. Whether regarded as a symbol of female oppression made manifest or as an object of fetishistic fascination, the corset is marked by a history of controversy, sexuality, power and pleasure – and one chapter of that history certainly belongs to Mr Pearl. 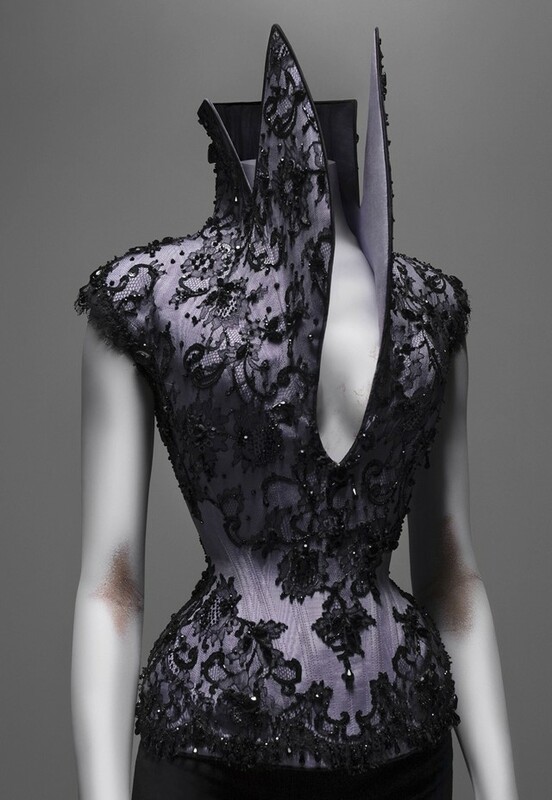 Since the seeds of fascination were sewn when, as a child, he would lace his grandmother into her corsets, he has dedicated his life to the much-misunderstood garment, creating now-iconic pieces for the likes of Thierry Mugler, Jean Paul Gaultier, John Galliano and Alexander McQueen. Ahead of tomorrow’s opening of the Victoria and Albert Museum’s Undressed: A Brief History of Underwear, which features a design created by Mr Pearl for longterm collaborator Dita Von Teese, we speak to the couturier about nights out with Leigh Bowery, meeting McQueen and why, no matter the pace of today’s fashion industry, his work will always take time. What was the energy in London like when you arrived in the early 80s? Mr Pearl: Well, it was very different to how it is today, of course. Margaret Thatcher was in government, and there were fantastic nightclubs to go to, and that was what it was all about. Dressing up and going out. Even though I was on the dole, in a squat – nothing was more important than going out. On the nightclub scene, there were many butterflies of the night, as they were called, and I was very lucky to meet these people. Steve Strange was still doing clubs, and then Taboo opened, which was one of my favourite places, where I became very friendly with Leigh Bowery, and became his assistant and worked for him for quite some time. It was very vibrant, very creative… It was hedonistic. It was all about having fun, and being creative at the same time. Your access fashion was more limited – you couldn’t just go and buy outfits, so there was more of a focus on making things. Mr Pearl: That’s right. We created our own things, or we found them in the market and changed them. Also, you couldn’t look at fashion unless you bought a magazine, which at that time, I couldn’t afford. Fashion was really never my focus, so I became involved in it totally by chance. I was more interested in the theatre and the dance – I was busy at that time in the 80s making costumes for the dance, for Michael Clark, for Matthew Hawkins. Through this, I started to want to focus on a particular silhouette, and they led me to want to take it further, and to understand how tiny waists can be created with fabric. Was there anyone that you particularly trained under when you were learning how to make corsets? Mr Pearl: It was trial and error; I also found some corsets in the market which I unpicked, and started to work from. Along the way I met certain people who were kind enough to impart knowledge that they had gained through the wearing of corsets. One particular person who was very important to my training is a lady called Miss R. She is a tight-lacer, and she has dedicated her whole life to corsetry. She doesn’t make corsets but she wears corsets, and she has a great knowledge of what is required with regard to corsetry in terms of it being comfortable, healthy and wearable on a daily basis. My first client for corsetry was Pete Burns, from Dead or Alive, followed on by Susanne Bartsch, who lived in New York. In fact, that’s how I came to New York, through her. Because she did her first Love Ball in ‘89. I went with Leigh, because he was the MC of the evening, and I made the outfit for Susanne – it was at this Love Ball that I met Mr. Thierry Mugler, who subsequently invited me to make something for one of his runway shows in Paris. And that’s how I became involved in fashion. It was quite a big jump then, from making a couple of things for people to making something for a runway. Was it an intimidating task? Mr Pearl: Well, yes it was, because it had to be done in two weeks, and it was fully beaded – it was a hat, a corset, chaps, gauntlets, and shoes. 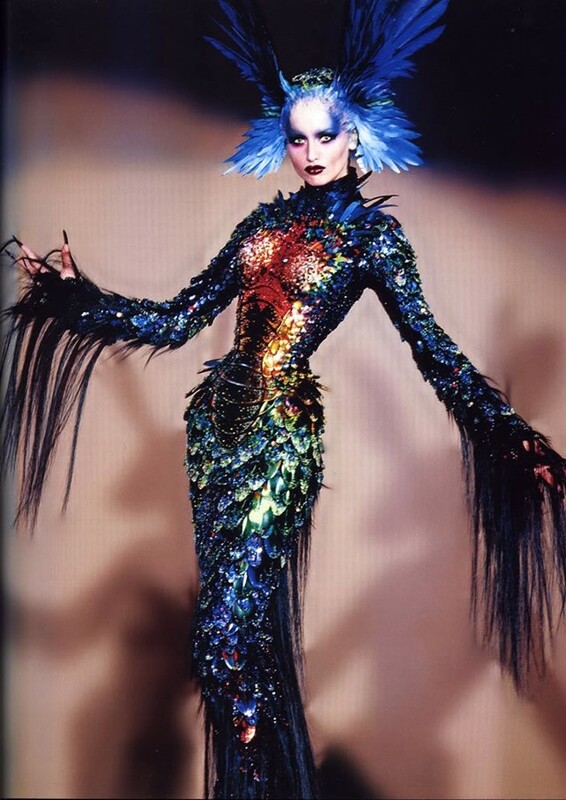 Then, of course, it was Thierry Mugler. I had only seen pictures of his work in magazines from a friend of mine, Dean Bright, who was at Saint Martins at the time. I was able to go and look at magazines in the library there, and I had seen pictures of his work in the 80s. So it was quite daunting, I must say. Anyway, he was very pleased with what we managed to do, because of course I had to have some people help me. Then he asked me to do more, until his house closed. You also walked for Alexander McQueen show – how did that come about? He was, at that time, in the basement in Elizabeth Street, in one of Isabella Blow’s places. 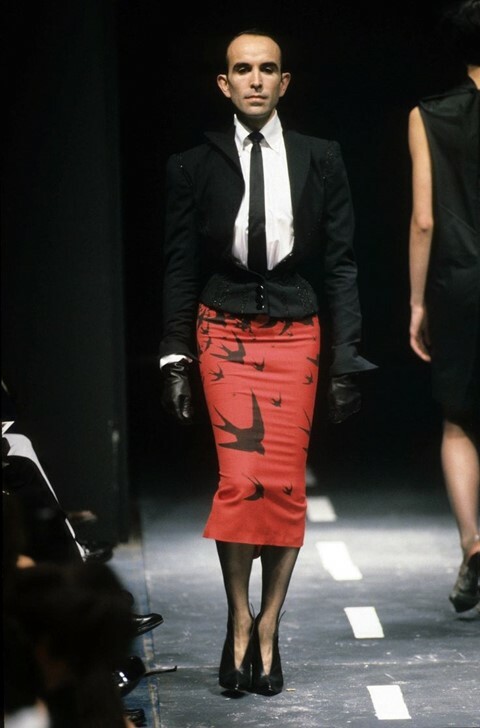 It was his third collection, The Birds collection, in King’s Cross. He basically made the jacket on me, and I modelled for the show, which was a very strange experience. It was the only time I’ve modelled, and I’ve never modelled since. Anyway, when I went to the newsagent the next day there was a picture on the front page of the newspaper. The man in the newsagents said, ‘Ha ha, we know what you’re up to.’ So that was that. Working with him… In actual fact, I only ever made one corset for him. That was for the subsequent show that he did in the Whitechapel church, the Hawksmoor church, for Honor Fraser, the beautiful Honor Fraser. It was this lilac moire corset with black Chantilly lace. The colour that stands out…and that’s the only piece that I made for him, because it was quite complicated working with him, I must say. At that time. Perhaps afterwards he relaxed and became more comfortable, I don’t know. What can wearing a corset bring you in terms of your own body, or emotionally? Mr Pearl: Speaking personally, and other people would agree, it aligns your body, firstly. It elongates the spine. It places everything in order, in a way. Your mind also has to be in order to wear it, and so this is a very positive feeling. I would say it enhances one on a daily basis in a very positive way – a positive frame of mind. It also prevents you from becoming unduly stressed, because if you become stressed the corset can really aggravate you. In a way, you can’t let yourself go there. So it sort of balances you, really, which I think is important in today’s world. Because everything is all over the place and it’s so stressful. Also, you cannot rush around. You cannot slouch. You eat moderately, you cannot drink beer, there are certain things you can’t do. Mr Pearl: It’s totally about discipline, yes. It’s all about that. And practice, too, on a daily basis. It’s totally ritualistic, it’s an ancient ritual. When practiced today, one feels connected to that very ancient form of body adornment. Today, people believe it is only the domain of the female, but it was always practiced by males and females. It’s very ancient, it goes back to the Minoan culture, to Crete, and so that’s what fascinates me about it. How much is it a solo activity – or does someone else always have to lace up the corset? Mr Pearl: Of course, if you were lucky enough to have such a relationship with somebody, that would be ideal. But generally, it’s practiced solo, for one’s self. In the more extreme cases… for example, Ethel Granger has the Guinness World Record for the smallest waist in the world, which was 13 inches. And she looked like that till she was 83. She was corseted because of her husband, her husband required that, you see. So she had this relationship, whereas many people I know don’t have this, including myself. I never had a partner who required that, and who encouraged that. Of course, the more sensual side of it is if you had somebody who really appreciated that, and who loved to lace you in and that flicked their switch… but my personal experience of it is not for that. It’s something very personal and internal. Corsets are seen as a symbol of oppression, but how far do you think they provide a possibility for someone to learn more about themselves and to be empowered through the transformation of their own body? Mr Pearl: Well, absolutely. Today, people think nothing of going to put their bodies in the hands of a plastic surgeon, which I find quite shocking, myself, when they could discover much more about their bodies simply by using a corset, which is laced on and laced to your own degree of satisfaction. Also, it doesn’t require anesthetic and knives. But people have a fear of this particular garment, because it has a mystery about it: people believe it to be extremely unhealthy and dangerous, for one. That comes from when corsets started to be mass-produced, but you cannot mass-produce this garment, because it needs to fit you like a glove – every body is totally different. So if you go off to the shop and buy an off-the-peg corset, it can never hope to be totally comfortable. I think that’s why people have this fear of corsets, because people rushed off and bought them, hoping to obtain a wonderful hourglass figure overnight, and caused damage to themselves. It’s a conundrum, in a way. If the corset was made perfectly to measure for you, there should be no such problem. I think that because of the way it manipulates the carriage of the whole skeleton, it creates an empowering feeling, because you are sort of stretched upwards. You cannot slouch. You can’t feel down, in a way. You’re always walking on air, because you’re held by this. It’s a kind of carapace, it’s a protection to help you face the world. That’s in my experience. What do you think about the pace of fashion? Because obviously, your work takes so much time, and you can’t rush it. But the industry seems to want everyone to rush. Mr Pearl: That’s why it’s disintegrating, I think. Because people do not take time, and things do take time. You can’t just make something by… well, nowadays you can, you can print it out in 3d from a computer. But it’s not the same. It doesn’t have that soul. I believe hands have become very sadly neglected. The hands in India and China are very busy but they get paid 2p a day. So, hands in Europe are no longer affordable. It’s quite frightening, actually. That’s why I no longer work on couture, because they don’t have time for me, and they would rather go and have it done cheaply, somewhere else. So you work with private clients? Mr Pearl: I work with private clients, but fewer and fewer because of the pace of life. People call up and say, oh, I need something for next week… well, it doesn’t work like that. How long would you say a piece takes on average? Mr Pearl: It depends if the person is available. The minimum sittings are three, so if the person isn’t available there could be some time in between each sitting. Then, I would say, a sort of ballpark timeframe is about a month. Minimum. Depending, of course, on what the client wants. If the client wants a full-body, high fetish corset, that’s going to take probably six months. Whereas, in couture, people work very late. So that means a lot of things have to be put together at lightning speed. You have to have a good team to rely on, and they have to be available all hours day and night, which is not really a healthy way to do things. One also needs to sleep and eat and one needs to keep one’s strength up. So I just don’t know. The thing is, corsetry exists beyond fashion. Fashion flirts with corsetry from time to time. It brings it back, it then says no, it’s in, it’s out. Corsetry exists on its own plane. It doesn’t need fashion, if you know what I mean, because as you mentioned it has this connection to ritual. Fashion doesn’t. It’s in or it’s out. Fashion comes and goes. Corsetry is almost like a shoe, it’s like a hat, it’s like a glove. It will always exist.